Durham Cathedral is one of the great buildings of Europe. Set grandly on a rocky promontory next to the Castle with the medieval city huddled below and the river sweeping round, the profile of the World Heritage Site is instantly recognisable to people travelling up and down the East Coast Main Line. 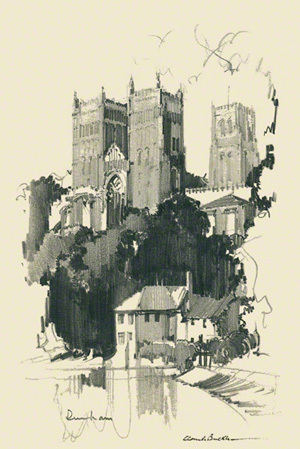 This view used by Claude Buckle is probably the most popular scene, set off by the river Wear and the high Cathedral promontory; it is taken from across the river opposite the Cornmill. Durham Cathedral is a Christian Church of the Anglican Communion, the shrine of St Cuthbert, the seat of the Bishop of Durham. Recently (2013) Durham Cathedral hosted the displaying of the Lindisfarne Gospels describing the story of St Cuthbert. This priceless book and one of the world’s greatest books, on loan from the British Library, could be viewed in its original form.